Ideal for those that require a larger seating area when using the toilet. The luxurious contoured seat provides the user with comfort, whilst being stylish and ergonomic in its design. 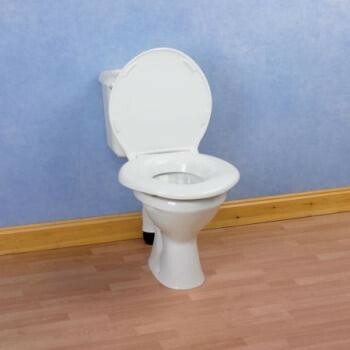 Bariatric Toilet Seat...Ideal for those that require a larger seating area when using the toilet. The luxurious contoured seat provides the user with comfort, whilst being stylish and ergonomic in its design. Easily fitted and secured to the toilet pan. Fits to most toilet frames. Maximum User Weight: 60 Stone (381kg). Seat size 482 x 482mm (19 x 19"). Aperture size 292 x 222 (111/2 x 83/4").